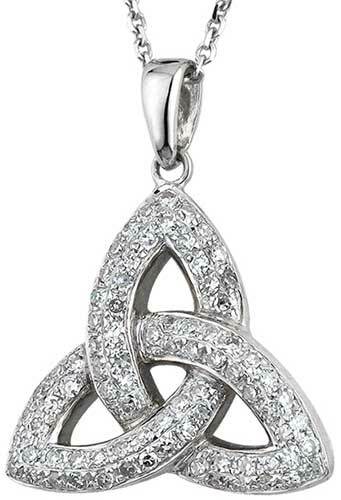 This 14K white gold Celtic necklace features a Trinity knot that is studded with 63 individually set round brilliant cut diamonds for a .32ct total diamond weight; the diamonds have a clarity grade of SI 1-2 and are G-H on the color scale. The Celtic pendant measures 5/8” wide x 3/4" tall, including the jump ring and the chain bail, and it includes an 18" long 14K white gold chain. 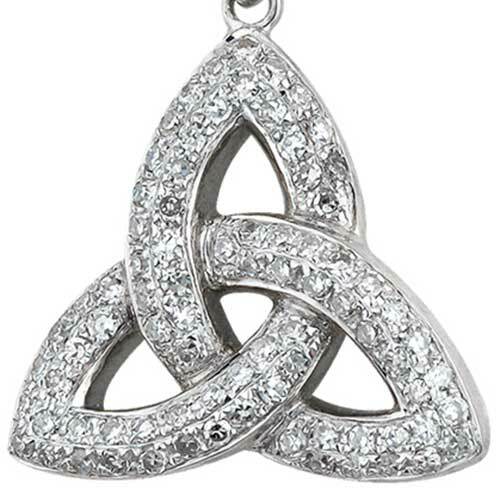 The diamond Trinity necklace is made in Ireland by Solvar Jewelry and it is gift boxed with a Celtic knot history card, complements of The Irish Gift House.